The most important news from CES 2015 involves hundreds of millions of dollars and a titan in the tech industry. It has its origins in a movement that scarred the latter half of 2014. It's not a gadget. It's not a service. It's not something that's for sale at all, actually. 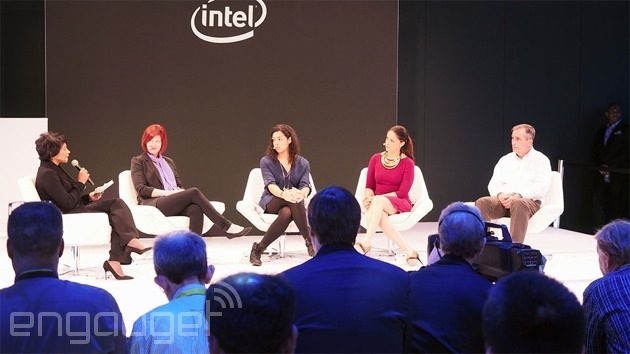 The most important news at CES 2015 comes from Intel of all places, which announced its Diversity in Technology Initiative on Tuesday evening: an ambitious $300 million investment, intended to "increase the representation of women and underrepresented minorities in the workplace and our industry" through partnerships, hiring and oversight. As Intel CEO Brian Krzanich puts it, "This isn't just good business; this is the right thing to do." For a company that's over 75 percent male, it's about time. This week's announcement is a serious about-face from the mixed messages Intel was sending out a few months ago. To properly understand the situation Intel was involved in, you've got to take yourself back to the caustic environment of mid-to-late 2014. The contentious subject of "GamerGate" was in full swing. A loosely collected group of self-identified "gamers" unified under a Twitter hashtag -- "#GamerGate" -- which claimed to be fighting for ethics in game journalism. Despite that announced intention, the group was largely associated with threats, harassment and "doxxing" (the act of publishing the address and other identifying information of private individuals). More specifically, the "GamerGate" movement targeted female game developers and prominent media critic Anita Sarkeesian. It was, and is, a movement co-opted by hangers-on who have no interest in gaming, no history in the game industry; people like Christina Hoff Sommers and Milo Yiannopoulos, which Gawker aptly describes as, "The D-List Right-Wingers Who've Turned Gamergate Into Their Loser Army." "Intel has pulled its advertising from website Gamasutra. We take feedback from our customers very seriously especially as it relates to contextually relevant content and placements." "We take feedback from customers seriously. For the time being, Intel has decided not to continue with our current ad campaign on the gaming site Gamasutra. However, we recognize that our action inadvertently created a perception that we are somehow taking sides in an increasingly bitter debate in the gaming community. That was not our intent, and that is not the case. When it comes to our support of equality and women, we want to be very clear: Intel believes men and women should be treated the same. And, diversity is an integral part of our corporate strategy and vision with commitments to improve the diversity of our workforce. And while we respect the right of individuals to have their personal beliefs and values, Intel does not support any organization or movement that discriminates against women. We apologize and we are deeply sorry if we offended anyone." It took another month before Intel's ads were back on Gamasutra, and the company shrank back into the periphery of the GamerGate controversy. Fast-forward two months and Intel's got an hour-long press conference at CES 2015. GamerGate has largely fizzled, and Intel's managed to escape relatively unscathed from its PR nightmare. That's all to say it's a major turn for Intel to not only push itself back into the spotlight here, but also to intentionally stand on the right side of history and put its money where its ideals (supposedly) are. And this isn't just a financial investment with oversight, but a cultural shift at Intel overall. The company's pledging "full representation at all levels of our workforce by 2020." That extends to management as well, whose pay will be tied to the company's progress. Think that sounds like small potatoes? Intel employs over 100,000 people. The concept of what the company's doing here expands enormously when scaled up to an organization of Intel's size. Even better, Krzanich specifically cited Intel's mistakes over the past few months as a catalyst for this week's announcement. "A confluence of industry events has brought this issue to the center stage: From the threats and harassment that has characterized the debate in the gaming world, to the publication of hiring data and diversity statistics in the tech industry. This is a highly relevant issue and one that we all need to address," he said onstage. Make no mistake: The $300 million investment and change in hiring policy is a genuinely positive result of the last six months of awful garbage. It's also, of course, a response to the actual data that shows how starkly non-diverse the tech industry is. How about Google's data to start? Remember, this is the "Don't be evil" company. "About 91 percent of Googlers are either Asian or white, and 70 percent are men," we wrote in May 2014, citing a Google internal study. Google has just over 55,000 employees. The situation at other tech giants isn't much better. eBay leads the diversity charge with a far higher percentage of female workers (42 percent), while biggies like Twitter are just as bad as Google (with about 30 percent female employees). And Intel, who conspicuously didn't note its diversity numbers while announcing its diversity initiative? The Atlantic reported back in August that around 24 percent of Intel employees are women. As that piece points out, publishing diversity statistics (or lack thereof) doesn't make much of a difference in actually increasing diversification of employees. So, what does? Action! That's why Intel's move is such a big deal -- the biggest news at CES 2015, lest you forgot -- and why I've been evangelizing the move since Tuesday night. At least something good came out of the whole GamerGate mess.